North-Channel cruisers know about the Cruisers’ Net, operated by Great Lakes Cruising Club (GLCC) member Roy Eaton in Little Current during the cruising season. 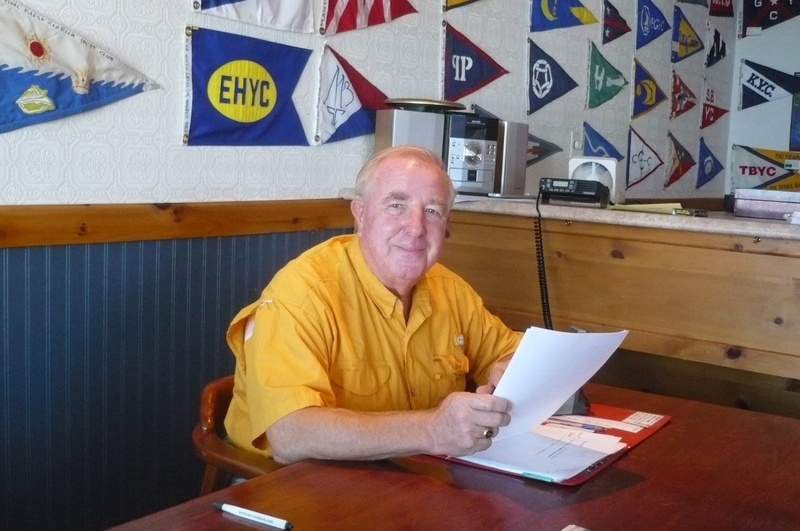 Every morning, Roy is on VHF Channel 71 for about an hour, operating out of a small room on the second floor of the Anchor Inn, right across from the town docks. First, he asks if there are “any medical, emergency, or priority requests.” Then he relays marine forecasts for the area, followed by a short summary of Canadian, U.S., and world news and sports. Finally, there are the “check-ins,” where cruising boats report their locations and sometimes their destinations. During the height of the season, as many as 170 boats will check in every morning. Roy also relays messages from boat to boat and deals with a miscellany of other matters of interest to cruisers. Roy Eaton, ready for his Cruisers' Net broadcast. One morning, GLCC members Fred and Jennifer Bagley on Catamount reported to Roy that they had found a fine camping cookset in a nylon carry bag, left hanging on a tree branch onshore at Matheson Island. Later, another cruising boat, Quintessence, anchored in McBean Harbor 6 miles away, reported to Roy that some kayakers were loading up their car at the end of a trip, only to discover that they did not have their camping cookset. Roy had the skipper of Quintessence, get the kayaker’s name and address. During the next day’s check-in, he asked the Bagleys to bring the cookset in to Little Current, so Roy could mail it to the owners in Michigan. Over the next few days, a series of VHF messages followed, the upshot of which was that the Bagleys contacted us, and we agreed that it would be much easier to mail the cookset from Cheboygan, Michigan on our return at the end of August, rather than having Roy try to get it through the Canadian postal system and across the border. The cookset handoff was made from Catamount to us in Hotham’s west harbor. Roy got the owner’s name and address, Stillwater, Minnesota (not Michigan after all) to us by VHF. The cookset made it across the border to Michigan and through the US postal service to Minnesota. Here’s a second example of thoughtfulness and assistance provided by our boating community, brought together via the Cruisers’ Net, in 2011. One morning, Roy did his usual “any medical, emergency or priority request” and a woman replied that her husband had a bad eye infection. She was worried about him and especially about sailing into an east wind to take him to the hospital at Little Current. Dr. Daniel Sharp, cruising on Milaur, was listening to the Net and replied immediately. By coincidence, not only is Dan a noted opthamologist, but both boats were in the same anchorage. He dinghied over, provided assistance and reassurance to the couple, and returned again in the afternoon. Great house calls—or more accurately boat calls! Dan, by the way, is the GLCC Port Captain for Sault Ste. Marie, Ontario. Two stories of GLCC members providing assistance through Roy’s Cruisers’ Net. If you’re in the North Channel next summer, be sure to tune in VHF channel 71, 9 am every morning. Thank you for posting a great story. I wasn’t aware of your involvment in the final process with the camping stove. What a complicated but very satisfying tale.